These low-carb recipes are not just healthy but also delicious. Do you often eat junk during snack time? There’s something about the hunger that strikes you at 5 pm that tempts you to opt for a piping hot samosa instead of, say, a healthy bowl of fresh fruits. After all, a good accompaniment to your cup of chai or coffee has got to be something tasty and satiating. Instead of heading down to your office canteen and eating greasy deep fried food or ordering something fattening from the nearby cafe, why not eat something you can cook quickly in the morning and pack in your tiffin box? Try making these delish, quick, snack recipes that are good for your taste buds and for your waistline. In a bowl, pour the poha and microwave 2 minutes until crisp. You could also toast the poha on a pan. Transfer into a clean bowl. Heat the oil and roast almonds in it. Keep aside. In the same oil, add mustard seeds, curry leaves, turmeric powder and the kasoori methi. Sauté for 30 seconds. Add the almonds into the oil and mix for 1 minute. Cooked quinoa by soaking white quinoa in water for 20 minutes, then adding it to boiling water and cooking for 5-7 minutes till you see baby sprouts. Drain out the water and keep aside. Mix the kale salad with a pinch of salt. 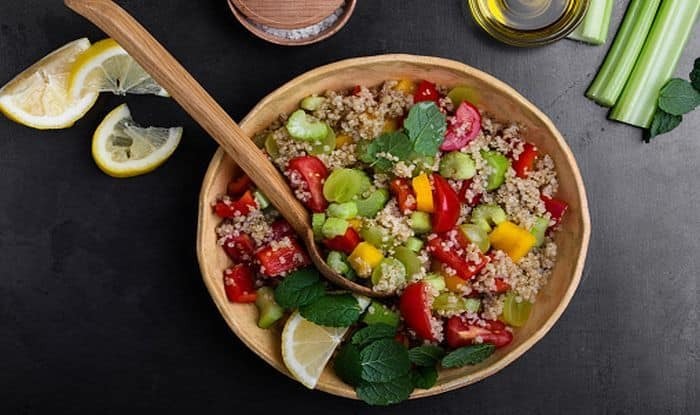 In a small mason jar, start layering with kale as the bottom-most layer, then add the quinoa as the middle layer and top with cherry tomatoes as the topmost layer. Place the flour and the semolina in a pot with the milk, curds, jaggery and a pinch of salt. Beat for 5 to 7 minutes so that the mixture becomes light and fluffy. Pound the peppercorns coarsely and add to the mixture. Heat two tablespoons of ghee and pour over the mixture. Mix well, cover the dekchi and let stand for 7/8 hours in a warm place. The mixture would have risen by this time. Stir it well. If it is thick, add a little milk or water to bring it to the pouring consistency. Add and blend in it a pinch of soda and juice of lime. On a pan, put a tbsp of ghee and gently put in one tablespoon of the ready batter. Let it turn golden brown on both sides. Take out with a slotted spoon and place in a strainer so that the extra ghee drips down.